The T1000 is an XT-class laptop from 1987. Its specification and form factor are similar to the IBM Convertible. What makes the T1000 unusual is that it includes a copy of MS-DOS 2.11 in ROM. There are at least two versions of the BIOS: 026C (BIOS v1.10, 29 June 1987) and 026F (BIOS v4.10, 2 May 1988). I have worked from the later BIOS when writing this page. The supplied programs use various techniques, but the best seems to be to check the BIOS ROM. The byte at F000:FFFE should be 0FEh (machine class is XT) and the byte at F000:FFFA should be 2Ch. The byte at F000:FFFA is also 2Ch in other Toshiba laptops, such as the T3100e, but in the case of the T3100e the machine class is 0FCh (machine class is AT). ROM drive size. Pins 1-2 for a 512k ROM, 2-3 for 128k or 256k ROM. ROM chip type. Pins 1-2 if the ROM chip has address 16 on pin 2 and enable on pin 24 (like the 27C040). Put the jumper on pins 2-3 if the ROM chip has these two pins reversed (like the Toshiba TC571001 / Hitachi 27C301). Font select. If both are closed, display font is codepage 437. If PJ21 is open, display font is Danish. Some motherboards (including mine) don't have PJ20, so I've no idea what might happen if it's opened. Physically, the ROM drive is a 256k or 512k chip sitting in the motherboard alongside the BIOS ROM. In my T1000 it was a TC534000P chip, which my EPROM programmer could read using 27C040 settings. Despite being labelled as a 512k chip, it could well have been a 256k chip since what came out of it was two copies of a 256k ROM image. Access to the ROM drive is accomplished by output to port 0C8h. Bit 7 of the value written is 1 to page the ROM in at A0000h, 0 to page it out. The remaining bits select which 64k range of the ROM should appear at A000:0000. This mechanism would allow a ROM drive of up to 8Mb, but the hardware doesn't support more than 512k. 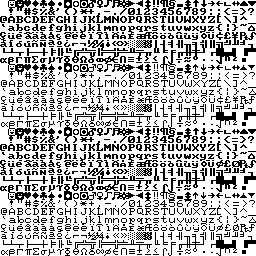 Dummy files (named DUMMY1 / DUMMY2 on the earlier ROM, DUM and KB1000\DUM on the later). SELECT.EXE (generate CONFIG.SYS) is version 2.20 in the earlier ROM, 3.20 in the later. The contents of the ROM drive consist of a 1k header, followed by a FAT12 filesystem (unlike a hard drive, it is not partitioned). The BIOS parameter block is identical to that used for a standard DOS 713k floppy; since the ROM is actually smaller than 713k, a dummy file occupies all the clusters that are 'off the end' of the ROM. In theory other formats could be used, but they must have 9 sectors per track, because that figure is hardcoded in the BIOS. 00-02	DB	0, 0, 4		;ROM size, bytes. Mine is 256k. 03-05	DB	1, 2, 3		;Head, Sector and Cylinder of CONFIG.SYS file. ;with data from non-volatile RAM. ;Intel order of DCh, 45h. 0B-3FF	Does not appear to be used; can be filled with FFh bytes. This patch appears to fall in one of the keyboard drivers, and I'm not sure of its purpose. I have written two programs to convert from a normal disc image (or real floppy) to a ROM image, or vice versa. t1000rom.zip contains a download for DOS, plus source for any platform with a functioning LibDsk. If you want to do it manually, this USENET article describes how to program a new ROM drive image. Some of the steps given can be simplified by (for example) using a dedicated disc imaging tool rather than DEBUG, or loopback-mounting a disc image under Linux. is changed from write to read. 0C2h: Input. Returns next byte. 0C3h: On output: Set mode. Bit 0 = 1 when next byte ready to be read. Bit 1 = 1 when next byte ready to be written. Bits 6,7 = mode, as output. written. That implies bits 2,3,5 are always 1. OUT 0C0h, 00h	;Possibly this resets the read/write address. Wait for bit 1 of IN 0C3h to be 1. OUT 0C3h, 40h	;Set read mode. For 160 bytes: Wait for bit 0 of IN 0C3h to be 1, then read byte from IN 0C2h. OUT 0C3h, 00h	;End reading. For 160 bytes: Wait for bit 1 of IN 0C3h to be 1, then OUT 0C0h, byte. There are 82 keys, of which 81 generate normal scancodes. The remaining key is the 'Fn' key, which modifies the behaviour of the following keys. Note that some of the keystrokes below have no meaning on the T1000, but are detected presumably because the T1000 shares components with the T1200. Bit 0 } Unknown, always appear to be 0. The BIOS copies bits 2 and 4-7 of the last value read from port 0E1h to port 0E2h; this seems to be so it can detect changes in the value read. I don't know the purpose of bits 0,1 and 3 of port 0E2h. There is a socket for an external numeric keypad. This is a simple 2-pin serial connection, not the 8-pin connector used on the T3100e. AH = attribute mapping. Bits 2-3 for colour on colour, bits 0-1 for colour on black. AL = display type: 0 for plasma, 1 for CRT, 2 for LCD. Set contrast settings in AL. Bits 2-3 for colour on colour, bits 0-1 for colour on black. If bit 7 of AL is set, save these values to CMOS as defaults. The four possible options for each contrast setting are 0 for normal, 1 for inverse, 2 for high-intensity normal, 3 for high-intensity inverse. At a hardware level, CRTC register 12h contains these settings. The top four bits are read-only and give the display type (bit 5 reset for CRT, bit 4 reset for LCD, both set for plasma) while the bottom four hold the contrast settings and are read-write. Bit 5 set: Thin font. Bit 6 set: External display. Bit 7 set: 'Turbo' on. Although the T1000 has no turbo mode, the BIOS still checks bit 7 of this port when accessing floppy discs; if the bit is set, then a timing loop is run twice as many times. The font ROM is a surface-mounted TC53257 ROM. According to the hardware manual this is an 8k chip, but the TC53257 datasheet says it's 32k. I haven't been able to dump its contents, so I don't know in what order it stores its fonts, and whether it contains other fonts not used by the T1000. The RTC is a TC8521, which is a 4-bit chip. The chip is visible at I/O ports 2C0h - 2CFh. Contains system date and time. 2C0: Set to 5 to indicate 'RAM contents valid'. 2C4: Bit 1 = keyboard emulation (0 for 101 keys, 1 for 84 keys). Bit 2 = 1 to use memory copy of CONFIG.SYS when booting from ROM drive. 2C8-9: Hard RAM size / 64k. 2CBh holds high nibble and 2CCh holds low nibble. 2C4h holds boot device: 0 for RAMdrive, 1 for floppy, 2 for ROM. Whenever the PAGE register at 2CDh is being written, bits 2 and 3 are always 0 and 1, respectively (enable clock, disable alarm). 128k can be used to increase conventional memory to 640k. Some or all of can be used as a persistent RAM disk ('Hard RAM'). The remainder, if any, can be used as EMS memory. 50h Low 4 bits: EMS I/O port. 0 => 0208h, 1 => 0218h etc. If set to 7 or 0Fh this disables EMS and hard RAM. High 4 bits: Always 9 to indicate presence of the memory card. The test program TEST10 also checks for 8, which may indicate a memory card that isn't battery-backed. Low 4 bits: EMS I/O port. High 4 bits ignored, write 0. 51h Low 5 bits: Start address of EMS within the card RAM, divided by 64k (00h-0Ch). Memory below this address is used for conventional / hard RAM; memory above it, if any, is used for EMS. High 3 bits: EMS page frame address: 0 => 0C400h, 1 => 0C800h, 2 => 0CC00h etc. Low 5 bits: Start address of EMS within the card RAM. High 3 bits ignored, write 0. 52h Bit 7: Set to use the first 128k of the memory card as conventional memory. The programmer is responsible for setting the EMS start address higher than 2 (ie, 640k) to avoid overlap. 00h The BIOS and test program always select register 0 at the end of an operation involving the memory card, thus rendering the registers less liable to change at the hands of a random program. The test program (but not the BIOS) also checks for the presence of a second memory card on the same ports, but using registers 60h - 61h. The hard RAM is presented as a second hard drive (D:). To access it, the BIOS moves the start of EMS memory to the start of the area designated as hard RAM, and uses standard EMS operations to read and write it. Internally, the RAM is formatted as a standard FAT filesystem, 16k less than the memory allocated for the purpose. The last 16k contains checksums for each 512-byte 'sector'. The checksums are verified at boot; if they are incorrect, the user is warned that the hard RAM is unreadable and must be reformatted. Although the hard RAM is presented as a hard drive, it doesn't have a partition table; it contains only a DOS partition. If you want to install a later version of DOS on it, you'll need to use that version's FDISK and FORMAT to set up a partition table. The T1000 will not boot without its rechargeable battery pack present. This consists of four NiCad cells in series, size 'Cs'. RS Components part number 377-7927 is a suitable cell from which to make replacement battery packs. The battery pack is connected to the mainboard by a four-way cable; the two red leads connect to the positive terminal of the first cell, the two black leads to the negative terminal of the last cell. The usual symptom of capacitor failure is that when the laptop is turned on, the power LED illuminates red, then green for about a second, then goes out. In some cases it may remain lit, but the laptop does not power up. A 'fishy' smell is also a good indication that at least one capacitor has blown. The problem is most likely in one of the large capacitors on the motherboard. If one of these shows obvious signs of bulging or leakage, that's most likely the culprit. If none of them do, you may have to replace all of them to find the guilty party. Desoldering the original capacitors is a difficult job, because the mainboard is tightly packed and it's all too easy to damage adjacent components. It's certainly not a task for an amateur.